It’s that time of the year, when people are making resolutions about all the ways to be better in the new year. We say — ditch all those expected resolutions and resolve to treat yourself at The Shops at Columbus Circle.When you start off the new year like this, it’s sure to be a very good 2019. It’s the ultimate splurge: the tasting menu at Per Se, complete with nine courses (perfect for 2019). 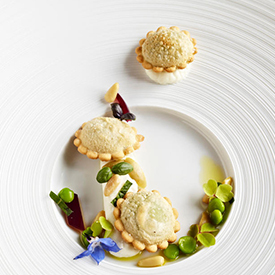 The restaurant was recently awarded the highest rating of three Michelin stars — a coveted and much-deserved honor that Per Se has held for 14 years in a row. During a memorable meal here, no ingredient is repeated twice. The menu changes every night, but you can look forward to dishes like Charcoal-Grilled Miyazaki Wagyu or Mascarpone-Enriched Chestnut Tortellini. There’s nothing more glamorous than a night out at the new Momofuku Noodle Bar, where the cocktail program is as indulgent as the swoon-worthy buns. 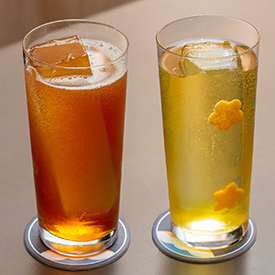 Bar Director Lucas Swallows teamed up with Anne Robinson — of hot cocktail bars like Booker & Dax and Dutch Kills — to develop highball drinks that will definitely kick off 2019 on a high note. Order up a Sundial, made with tequila, suze, and clarified orange cordial — and don’t stop at just one. We know you already have a gym membership at Equinox (and if you don’t, that’s our little secret). But even non-members can pamper themselves in the spa. 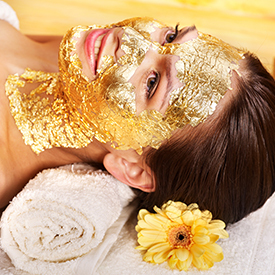 The ultimate extravagance: the 3 Lab 18K Gold Facial. We know — we had you at 18k gold. This over-the-top facial softens lines, boosts hydration, and takes years off your face. It’s a luxuriously decadent way to start the year. 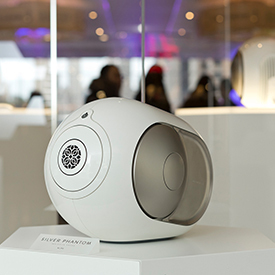 You’ll be able to play your music louder and better with the groundbreaking Phantom sound system from Devialet. Sure it comes in a sleek white, but this is the the year to spoil yourself, so go for the silver ($2,390) or gold ($2,990) version. With its explosive and immersive sound, this small but powerful sound system will take your home entertainment to new heights. The Peaceful Harmony Gold Tassel Mala ($669) from Satya Jewelry will help you head into 2019 with plenty of good vibes. 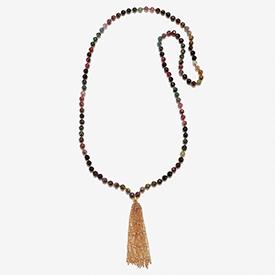 Designed with 108 faceted tourmaline beads, this necklace brings peace and clarity. And the 18k gold accent beads are engraved with the lotus flower, symbolizing the best of new beginnings.